Chief Big Elk, or Ong-pa-ton-ga, is one of the most iconic figures in Sarpy County history. This week marks sixty years since he was buried…for the third time. His original resting place was on Elk Hill in Bellevue. When Bellevue College was built, his remains were dug up during construction and reburied in front of one of the buildings. The Sarpy County Historical Society organized an effort to have his remains moved to a safer after the college was demolished and plans for a housing development made. The Omaha Tribe and Reverend John Linsley presided over the ceremony with hundreds in attendance. The trickle of westward migration that began during his lifetime become a flood with the passing of the Kansas-Nebraska Act of 1854 just six years after his death. No, our math is not wrong on that. The headstone of Chief Big Elk bears the date of 1846 as the year of his death but a recent discovery places the date of death as September 16, 1848. The year 1846 largely is based upon the work of Henry Fontenelle’s “History of the Omaha Indians.” Historian John Ludwickson uncovered the publication of the diary of Presbyterian missionary Edmund McKinney, who presided over Big Elk’s funeral. In this diary, McKinney discusses the condition the chief was in when he arrived at the mission. McKinney sent Big Elk some medicine, for which the chief was very grateful. 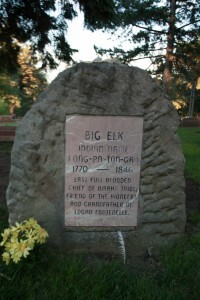 On September 16, 1848, McKinney wrote “This afternoon, our old and venerable chief, Onpatonga, or the Big Elk, departed this life.” Another important point Ludwickson makes in the article is that McKinney made a distinction between Chief Big Elk and his son who is also seen referred to as Big Elk in some records. This distinction adds further credence to Ludwickson’s claim that Chief Big Elk did in fact die in 1848 by clarifying that it was not a case of the son being mistaken for the father. Those who wish to pay their respects to the Chief will find signs pointing the way at the Bellevue Cemetery. His grave is located at the top of the hill, alongside the road, and overlooks the famous view from which Bellevue received its name.